Since the space-based gravitational-wave detection program has receded well into the future, and since the ground-based observatories are currently not taking data while they are being upgraded, I've being devoting more and more of time to the effort to detect GWs using pulsar-timing data. I'm very lucky to be aided in this work by my amazing postdocs Sarah Vigeland and Rutger van Haasteren, and by my colleagues Curt Cutler, Joe Lazio, Walid Majid, and Sarah Burke-Spolaor at JPL and Caltech. My last two papers to see the light (of arXiv) are indeed about pulsar timing. Bayesian inference for pulsar-timing solutions. This paper, with Sarah Vigeland, reports on new work in my favorite mold: showing that an approximated mathematical technique that is widely used just because it is the simplest thing to do is actually insufficient to do full justice to the physics in a certain regime, and that in fact it can lead to the wrong conclusions. 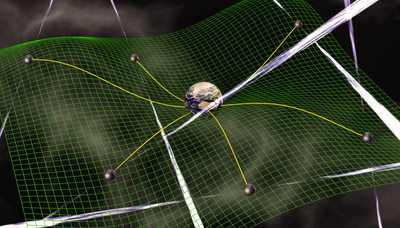 The approximated technique in question is the linear, maximum-likelihood least-squares fitting of pulsar timing models. These are the pulse-by-pulse timings that are fit to the observed time of arrivals of radio pulses to accurately determine pulsar parameters. Now, pulsar observations have very high signal-to-noise ratios, so it would seem that a local maximum-likelihood analysis would be adequate. Not so! At least not quite, and not always. In our paper, Sarah and I show that an analysis that is allowed to explore the full likelihood landscape and that uses the richer framework of Bayesian inference can lead to rather different parameter and uncertainty estimates than least squares. In fact, we argue that the nonlinear Bayesian analysis is the right thing to do. The gravitational-wave discovery potential of pulsar-timing arrays. This paper, by our full team, answers a question posed by Curt Cutler: "What if we forget what we know and expect about the most likely GW sources for pulsar-timing arrays, and figure out instead what constraints are set on detection by basic physics, statistics, and cosmology?" Thorne and Zimmermann asked a similar question for ground-based detectors in a 1980 paper that (I think) became famous for its cool title ("The Gravitational Waves that Bathe the Earth: Upper Limits Based on Theorists' Cherished Beliefs") but that has not been read by many (it appeared in a somewhat obscure volume of proceedings). The fun thing about asking this question is that you can convince yourself (or not) that your detection techniques, tuned for known sources, would nevertheless isolate signals that are unexpected, but within the realm of physical possibility. Also, some aspects of the answer can be intriguingly counterintuitive: for example, GW memory from early-Universe events can be easier to detect than the "direct" waves from the same sources; for another example (my favorite! ), while we usually reason that the more detectable sources are those nearest to us, if we set the rate and energy output of the sources by fixing the GW energy density throughout the Universe, we conclude the most favorable conditions for detection correspond to very few and very distant sources.